(1) The 8N628 Bearing (1) can be installed as a service replacement for the rear bearing of the camshaft in the fuel pump housing for sleeve metering fuel systems. 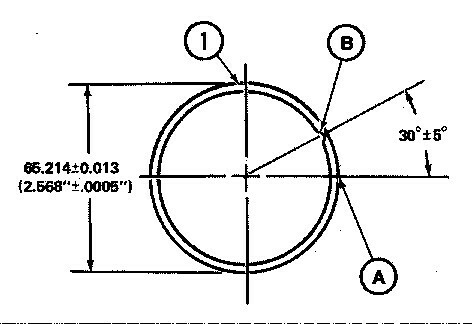 Joint (A) (contact point of bearing ends) and notch (B), on the inside diameter of the bearing, must be put in a specific position when the bearing is installed in the fuel pump housing. (2) Remove the camshaft rear bearing from the fuel pump housing. Be careful to hot damage the bearing bore in the housing. 1. 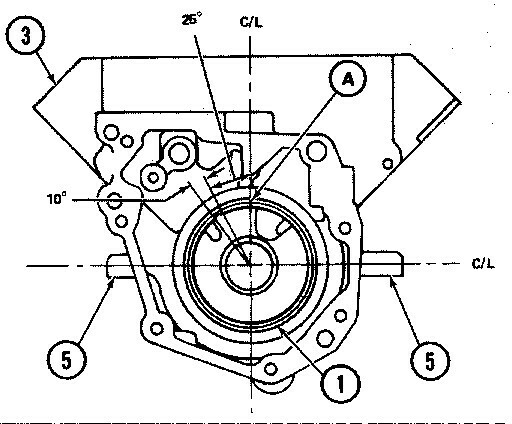 Use bosses (4) on 4 or 6 cylinder pump housing (2), and bosses (5) on V8 cylinder pump housing (3) to find the vertical and horizontal centerlines of the bearing bore. 2. 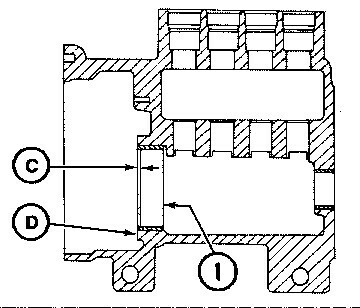 The correct installed location of joint (A) is shown on each of the above illustrations and notch (B) must be within the 10° location. (4) Install bearing (1) into the bore so dimension (C) [dimension from outer edge of bearing to face (D) of pump housing] is 0.114 ± 0.025 (.0045″ ± .0010″). 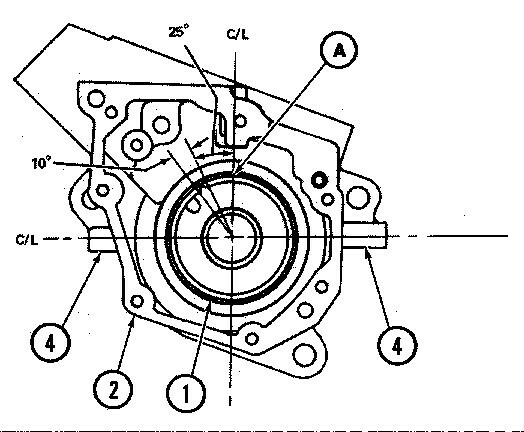 (5) Check to see that the camshaft will turn freely. With the new 8N628 Bearing (1) in the pump housing, clearance between the camshaft bearing journal and the bearing is 0.038-0.140 (.0015″-.0055″). (6) Assemble all parts to the fuel pump housing amd make all necessary tests and adjustments.